The Malagasy rosewood (Dalbergia spp) and ebony (Diospyros spp), both considered to be beautiful and durable, have been sought after for making ornate furniture. The wood is also greatly valued for manufacturing stringed musical instruments and numerous crafts. Though there is a global demand for the rosewood, most of the wood is shipped to China and some to United States and the European Union. Madagascar gained independence from France in 1960. Since then there has been political instability with oscillating governments. An uprising in 2009 resulted in a political deadlock which brought several economic sanctions on the country. In 2013, the return of democratic elections put Hery Rajaonarimampianina in the presidential seat. Though this brought a lot of fresh hope to the people, his regime failed to bring peace in the region. Disputes run deep between his supporters and opponents who tried to impeach him. The constitutional court disregarded the impeachment and the senate which was dissolved in the 2009 coup has been elected. The ban on the exports of rosewood has not been consistent and when there is a stricter ban in place, the prices rise and the illegally harvested timber is stashed away. 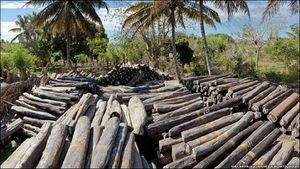 Most of the timber traders are also vanilla traders, so when there is a ban on the export of rosewood, they rely on the steady profits from the vanilla trade. And as soon as the ban is lifted, large quantities of rosewood flood the markets, bringing huge profits to the traders. The reasons for lifting the ban are cited as to salvage the trees felled by the frequent cyclones. However, experts say that the rosewood trees have such a high density which prevents them from blowing over in cyclones. 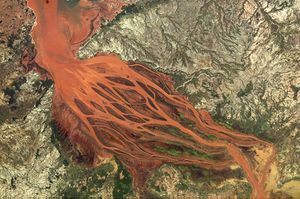 Madagascar bleeding into the ocean. Dubbed as the “the richest poor country in the world” the people of Madagascar have been subjected to the tyranny of dictators for generations. Most people live on a dollar or two per day and less than 15% of the population have electricity Madagascar was well on its way to achieving its Millennium Developmental Goals (MDGs) during the period of 2002-2006. However, the progress was undone during the period of political instability between 2009- 2013. About 70% of the total population and 77% of the rural population live below the national poverty line..According to a FAO report, more than 32% of the population is undernourished and nearly 50% of the children under the age of 5 suffer from chronic malnutrition.Experts believe if the benefits from illegally logged timber can be directed towards community based restoration of forests, there is still hope for Madagascar. "While Madagascar was long known as a graveyard for grand ideas, progress in the past decade has offered hope. In that time Madagascar went from the pariah of conservation to a model. There’s reason to believe history can be repeated". The discovery of the golden bamboo lemur and the rosy periwinkle marked a historical juncture that put Madagascar in the international limelight. The periwinkle which has been put to great use in the treatment of childhood leukemia, and the presence of the rarest animals brought hope of wealth and prosperity to the nation. But the enormous profits that could be gained by the rosewood logging took centre stage and country was exploited to the maximum. Embroiled by this devastation to her country, the environmental activist Razia Said who also happens to be a singer and a songwriter staged benefit concerts to create awareness to end illegal logging of the rainforests in her home country. The “Wake up Madagascar” tour was a part of this initiative. Her soulful song bears testimony to her love for Madagascar. 1.How could someone from a different discipline or profession add to the implications above? 2.What other implications become apparent when illegal logging is viewed through the lens of other disciplines and professions? 3. What special expertise, resources, or theoretical orientations might others bring to help us better understand the implications associated with illegal logging in Madagascar? The management policies and forestry regulations have so far not been able to resolve the problem of illegal logging in Madagascar as there are endless inconsistencies in regulations. The situation is further worsened by the people of higher authority who manipulate local people to practice illegal logging, which in turn prevents proper management of the protected areas. One extraordinary effort to expose illegal logging was undertaken by the British journalist Toby Smith, who went undercover in the forests to gather all the information and images under risky conditions. His efforts helped put international pressure on Madagascar to curb the logging. The Gibson Guitars case was a direct result of Toby Smith’s work. Since then, many of his images and articles have appeared in the global news which have put Madagascar under the watchful eyes. In the most recent times, there have been initiatives which bring a lot of hope to many countries suffering from the wicked problem of illegal logging. One such initiative is the AFR100 (African Forest Landscape Restoration) to restore 100 million hectares of land across the country by 2030.This initiative aims to build a strong network of technical and financial support to ensure benefits of food security, climate change resilience and poverty alleviation. Yet another initiative of the recent times which is worth mentioning is the Forest Legality initiative. This is a multi-stakeholder project led by the World Resource Institute (WRI). Their goal is to reduce illegal logging through supporting the supply of legal forest products. The WRI is also partnering with the Norwegian International Climate and Forest Initiative (NICFI) whose main focus is to mobilize new technologies to combat illegal logging and crack down on all the associated activities. This conservation resource was created by Shabana Zabi. It has been viewed over 287 times. It is shared under a CC-BY 4.0 International License. This page was last edited on 8 December 2017, at 23:52.